An architectural masterpiece of the 13th to 16th centuries, Westminster Abbey presents a unique pageant of British history. The shrine of St Edward the Confessor, the tombs of kings and queens, and countless memorials to the famous and the great. It has been the setting for every Coronation since 1066 and for numerous other royal occasions. Today it is still a church dedicated to regular worship and to the celebration of great events in the life of the nation. Neither a cathedral nor a parish church, Westminster Abbey is a �Royal Peculiar� under the jurisdiction of a Dean and Chapter, subject only to the Sovereign. In the 1040s King Edward (later St Edward the Confessor), last of the Anglo-Saxon kings, established his royal palace by the banks of the river Thames on land known as Thorney Island. Close by was a small Benedictine monastery founded under the patronage of King Edgar and St Dunstan around 960 AD. This monastery Edward chose to re-endow and greatly enlarge, building a large stone church in honour of St Peter the Apostle. This church became known as the �west minster� to distinguish it from St Paul�s Cathedral (the east minster) in the City of London. Unfortunately, when the new church was consecrated on 28 December 1065 the King was too ill to attend and died a few days later. His mortal remains were entombed in front of the High Altar. The only traces of this Norman monastery are to be found in the round arches and massive supporting columns of the Undercroft in the Cloisters. This now houses the Abbey Museum but was originally part of the domestic quarters of the monks. Among the most significant ceremonies that occurred in the Norman Abbey were the coronation of William the Conqueror on Christmas day 1066, and the �translation� or moving of King Edward�s body to a new tomb a few years after his canonisation in 1161. Edward�s Abbey survived for two centuries until the middle of the 13th century when King Henry III decided to rebuild it in the new Gothic style of architecture. It was a great age for cathedrals: in France it saw the construction of Amiens, Evreux and Chartres and in England Canterbury, Winchester and Salisbury, to mention a few. Under the decree of the King of England, Westminster Abbey was designed to be not only a great monastery and place of worship, but also a place for the coronation and burial of monarchs. Every monarch since William the Conqueror, with the exception of Edward V and Edward VIII who were never crowned, has been crowned in the Abbey. It was natural that Henry III should wish to translate the body of the saintly Edward the Confessor into a more magnificent tomb behind the High Altar. This shrine survives and around it are buried a cluster of medieval kings and their consorts including Henry III, Edward I and Eleanor of Castile, Edward III and Philippa of Hainault, Richard II and Anne of Bohemia and Henry V. The Abbey contains some 600 monuments and wall tablets � the most important collection of monumental sculpture anywhere in the country - and over three thousand people are buried here. Notable among these is the Unknown Warrior, whose grave, close to the west door, has become a place of pilgrimage. A remarkable new addition to the Abbey was the glorious Lady chapel built by King Henry VII, first of the Tudor monarchs, which now bears his name. The chapel has a spectacular fan-vaulted roof and the craftsmanship of Italian sculptor Torrigiano can be seen in Henry�s fine tomb. The banners of the Knights of the Order of the Bath, which surround the walls, together with the Battle of Britain window by Hugh Easton at the east end, give colour to this chapel. Two centuries later a further addition was made to the Abbey when the western towers (left unfinished from medieval times) were completed, to a design by Nicholas Hawksmoor. Little remains of the original medieval stained glass, once one of the Abbey�s chief glories. The great west window and the rose window in the north transept date from the early 18th century but the remainder of the glass dates from the 19th century onwards. History did not cease with the passing of the medieval monastery in 1540. Queen Elizabeth I, buried in one of the aisles of Henry VII�s chapel, refounded the Abbey in 1560 as a Collegiate Church, a Royal Peculiar exempt from the jurisdiction of bishops and with the Sovereign as its Visitor. 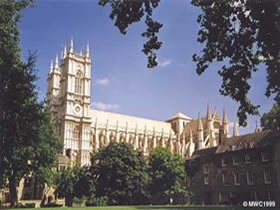 In place of the monastic community a collegiate body of a dean and prebendaries, minor canons and a lay staff was established and charged with the task of continuing the tradition of daily worship (for which a musical foundation of choristers, singing men and organist was provided) and with the education of forty Scholars who formed the nucleus of what is now Westminster School (one of the country�s leading independent schools). In addition the Dean and Chapter were responsible for much of the civil government of Westminster, a role which was only fully relinquished in the early 20th century. Thus the Abbey was reshaped and newly patterned to discharge a distinctive yet worshipful role in a modern age. Still today, a daily pattern of worship is offered to the Glory of God. Special services, representative of a wide spread of interest and social concern, are held regularly. In 1965-66 the Abbey celebrated its 900th anniversary, taking as its theme �One People�. Such a theme seemed to be fitting for a church which, through a long history of involvement with the developing life of the British people, has become known throughout the world.